This 4-door sedan is the new Chrysler 300 Luxury vehicle with room for 5 passengers. This car sports a refined exterior and lots of room for luggage in the trunk also. The average gas mileage for the 300 LHS is about 22 miles per gallon. Included Features: AM/FM/CD Stereo Radio, Power Steering / Brakes / Windows, Leather Seating, Eight-way Power Driver's Seat w/adjustable lumbar support, Six-way Power Passenger seat, Electronic Vehicle Information System with Driver Display, Air Conditioning w/ Automatic Dual-Zone Temperature Control, Express Open/Close Driver and Front Passenger Windows w/ Anti-Pinch Protection, Speed Sensitive Power Door Locks, Power Windows with Driver's One-Touch-Down Feature, Telescopic Steering Wheel, Front Power 12-volt Outlet, Low Fuel Warning, Power Trunk release, Power Heated Fold-Away Mirrors, Front Next Generation Multistage Air Bags, Rearview Day/Night Mirror, Fog Lamps, Electronic Stability Program w/ all-speed 4-wheel Traction Control and Emergency Brake Assist. 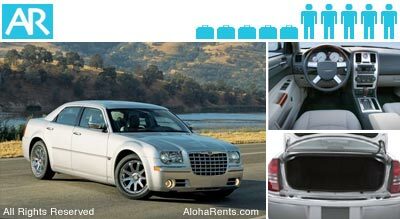 Luxury rental cars are excellent for couples, groups and families. All vehicles include unlimited mileage.